I decided I wanted to do a Westerns marathon this weekend. But the only problem is that most my western movies are very long... ranging from 2hrs to 6hrs (miniseries). So I decided to start this marathon early in hopes to fit enough movies in. I also decided that in between each movie I would watch 2 chapters of the movie serial "The Painted Stallion." On one side is an army of gunmen dead-set on springing a murderous sidekick from jail. On the other is Sheriff John T. Chance and his two deputies: one a drunk, the other a cripple. Place your bets. John Wayne is Chance in 'Rio Bravo', a lean Western classic packing solid heroics and a strong emotional core. He's joined by Dean Martin as the deputy coming off a two-year drunk, Walter Brennan as the old coot whose spirit outmatches his hobbled stride. Ricky Nelson as a youth out to prove himself and Angie Dickinson as the scarlet woman with her eye on Chance. Director Howard Hawks lifted the Western to new heights with 'Red River'. Capturing the legendary West with a stellar cast in peak form, he does it again here. This is the second time I have watched this movie since a good friend (Thanks Roger!) sent it to me. This movie is surprisingly long... clocking in at 2hours and 21minutes. But let me tell you... you would never know it while you are sitting there watching it. The time just flies by... and before you know it you are at the end of the movie. As much as I liked The Duke in the role of Chance... I absolutely loved Walter Brennen as Stumpy.... he was just absolutely hilarious. Anyway... This is an excellent Western... one of the best I have ever seen. Pete, my screen must be faulty. 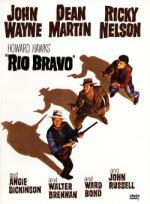 Only half of the last star for Rio Bravo is showing. Where's the other half? LOL... well there is a couple songs in this movie... that dropped it down a half a point for me! I have (and seen) Unforgiven... it is another very good western. Ohhhh, that makes sense then! You would also like El Dorado. Howard Hawks' own remake of Rio Bravo (Robert Mitchum is the drunk, but a sheriff. Wayne plays a visiting Marshall who used to know him). Can't remember if there were any songs. He sort-of remade it again in Rio Lobo. Definitely no warblers there! Thanks for the suggestions... don't have either of those. I am actually rather limited on what I have to include in this marathon... most I have watched.... but there is several I have not watched yet. Some of these are stretching it a bit... but they all take place in the old west. An American agent, Clark Stuart, is dispatched to Santa Fe to negotiate a trade agreement with the newly appointed Mexican governor. The former Governor, Alfredo Duprey, plots to sabotage the traety by substituting one of his own men for Stuart, At the same time, a wagon train bearing goods for trade is nearing Santa Fe. Duprey's men plan to attack it, but Clark Stuart aided by Jim Bowie, Kit Carson, and Davy Crockett saves the day. This is one of the serials I have never had the chance to watch. It was also given to my by my friend Roger. He has been trying to get me into Westerns (his favorite genre) for a while now. And I must admit... my taste for them has grown some. But still not what I would consider a favorite genre. Sometimes it takes a while to get into a movie serial. And it seems like this may be one of those for me. Don't get me wrong... I did enjoy what I saw so far... but just not as much as the previous serials I have seen so far. The first chapter is usually a little longer do to having to set up the story. So that is to be expected. In this one Kit Carson (a famous scout I take it) is just a young boy his first time out as a scout. Which he got by hiding along in one of the wagons. The Painted Stallion is rode by a woman dressed as an Indian. Using her whistling arrows to warn the travelers of danger. From what I can tell none of the characters has gotten a close enough look at her to even tell it is a woman.They just see an Indian figure up high in the rocks. It will be interesting to see if she is supposed to be a real Indian or just a woman dressed as one in the storyline. There is some comic relief... as there usually is in the serials. This one comes in the form of a cowboy (in the wagon train) that has an extreme case of the Stutters and his friend that interprets for him. As I said... over all I am enjoying this serial... but it ready does need to improve some for my taste. I think the only real stretch is Back to the Future III and it's still got the heart of a Western. The others you noted are simply comedy-Western's so just as valid as, say, comedy-Horror. You can go entirely the other way. There are many films that are built like a Western but look nothing like one. Lone Star for instance, or The Three Burials of Melquiades Estrada, both of which are set in modern day. The Western is the oldest and most versatile genre of all and many of the basic building blocks of film structure and narrative are there. Films like The Ladykillers, Seven Samurai or even Star Wars and Firefly are built on those templates, so you've got to go some before worrying about stretching! John Wayne produces, directs and stars in this "bigger than life" (Life Magazine) chronicle of one of the most remarkable events in American history. At the Alamo — a crumbling adobe mission — 185 exceptional men joined together in a sacred pact: they would stand firm against an army of 7,000 and willingly give their lives for freedom. Filmed entirely in Texas, only a few miles from the site of the actual battle, The Alamo is a visually stunning and historically accurate celebration of courage and honor. Co-starring Richard Widmark, Laurence Harvey and Chill Wills, and garnering seven Oscar® nominations, it is a "truly memorable movie spectacle" (Leonard Maltin). This is the first time I ever seen this movie. Another one that takes a while to watch. It clocks in at 2hrs and 42min. Unfortunately this one didn't go by as smoothly for me. Over half of this movie felt extremely slow. I was starting to think I would never get through it. Finally the battle came. This definitely helped the movie for me. I don't want to make this sound like I completely disliked the movie. Because I didn't. I enjoyed some of the storyline. It was just hard for me to get through such a long slow movie. ...and there is countless retellings of the story beyond that. IIRC John Carpenter went at it twice (Assault on Precinct 13 and Ghosts of Mars ). Except for "G, B & U" I don't see any spaghetti westerns. This puts me a third of the way through the serial. The serial has improved a bit for me. I find myself getting into it. It has some decent cliffhangers at the end of the chapters so far. And I am really enjoying the mystery that is surrounding the rider of The Painted Stallion. When workers in the remote mining town of Rejection, Nevada, fall victim to an unseen predator, the mines owner, Hiram Gummer [Michael Gross], great-grandfather to Tremors' Burt Gummer, hires a mercenary to destroy the carnivorous creatures before they swallow up his profits. What follows is an all-out assault that takes the battleground from deep in the earth to a suspense-filled showdown in the streets of Rejection! Tremors 4: The Legend Begins will thrill you with incredible action sequences, awesome bonus features and earthshaking special effects created by the award-winning team behind the original box-office hit, Tremors. OK... what we have here is a mixture of Western and Horror... something you don't see too often. I definitely enjoyed it... though I would say the first half hour was a bit on the slow side. In this movie you only get to see the graboid version of the creatures... of course in this movie they call them something different since the name graboid was thought of in the first movie... in this one they call the creature Dirt Dragons. The hired gun in this movie is played by Billy Drago... who I like a lot... ever since I first say him play the Demon of Fear in several episodes of Charmed. This brings me to the half way point of the serial. I am enjoying it more with each chapter that goes by. The chapter called Thundering Wheels shows that The Painted Stallion is a very well trained horse as "The Rider" sent the horse to free a captive Clark Stewert. ...looking at my collection this seems to be the only thing I own with her in it. Though it does appear that she had also gone by the name Jean Carmen. But I don't have anything else under that name either.